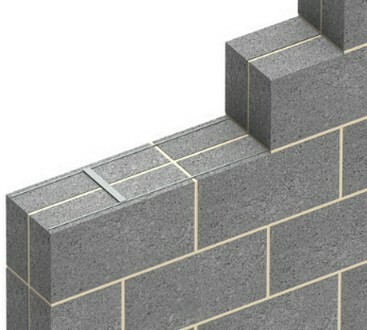 Ancon AMR-CJ masonry reinforcement allows the construction of collar-jointed walls i.e. two leaves of thin masonry used in place of a single leaf of wider, heavier blockwork. Ancon AMR-CJ is used to tie the two leaves together, so it acts as a single unit. The product consists of 20 x 2.5mm flat ties welded to flattened longitudinal wires. The longitudinal wires have a minimum characteristic yield strength of 500N/mm². AMR-CJ is supplied in a standard width of 175mm to suit wall widths of 215mm comprising two leaves of either standard bricks or 100mm blocks. Selection is based on calculation. Stainless steel provides the user with the greatest corrosion resistance and life-cycle costing benefits, and is suitable for use in any application.